Hate 2.0 – Page 21 – History in real time. To read more about Hate 2.0 in the news, see below. All alliterations aside, it is indeed curious to see how the media has seized upon Anders Breivik”s masculinity. Almost from the very beginning, when word first surfaced of the attacks on Utoye, Breivik’s image, whether in a wet-suit or sporting a preppy pink collar, circulated widely in the digital arena, putting a face, literally, to the man behind these heinous crimes. It didn’t take much digging to turn up a treasure trove of information about his own self-perception. Alongside his vitriol against the supposed Islamification of Europe was proof positive that this was a man deeply invested in performing the role of ascetic, mastermind, and — if need be — martyr. At the center of this, as SUNY-Stoneybrook sociologist Michael Kimmel noted in a widely-circulating blog entry comparing Breivik”s self-portrayal to that of homegrown terrorists like Timothy McVeigh, was a particular vision of masculinity under siege and a prescription for the kind of man needed to make things right. The Breivik case may be many things: a clarion call for the continued promotion of multiculturalism in a changing Europe, an example of the fine line between mental illness and criminal consent, and a social media spectacle. But it is also, fundamentally, a case study in 21st century masculinity in a heavily mediatized age. Gender-aka-masculinity has certainly entered media discourse surrounding the Breivik case but what about femininity — not just in Marcotte’s meaning, as in the lack of engagement with misogyny and the far right — but in relation to Breivik himself? On this question, yesterday”s testimony of Breivik’s four friends, and media reaction to it, proves most telling. Writing for the Telegraph (and tweeting from court) Richard Orange quoted that Breivik”s friends were concerned he was becoming depressed and reclusive in 2006 as a result of personal struggles surrounding his suppressed homosexuality. A failed internet date, withdrawing to his mother”s house, the use of powder and make-up — all proof, apparently, that Breivik was struggling with his sexuality, and dredging up in the process the time-honored link between homosexuality and right-wing violence. This link between repressed desire and extreme violence has been made before. Every decade or so a book comes on the market with spurious claims about Hitler’s homosexuality. For some, the notion of sexual dissonance provides critical insight into the orchestration of genocide in a way that race thinking, rightist ideology, imperial designs, and total power does not. Even the debate over the US Don”t Ask Don’t Tell policy saw Defend the Family President Stephen Lively claim that gays should not serve in the military since “open homosexuals are distinct from everyone else, men and women, in being exceptionally brutal and savage” (leading Jon Stewart and his merry gang of mischief makers to send up this thought in a video intervention). Going back a bit further still, many of the so-called 1968ers — the name given to the generation of student activists that challenged authority and governance instead of just “tuning in, turning on, and dropping out” — took seriously Wilhelm Reich’s thesis that fascism was caused, at least in part, by bourgeois gender norms and repressed bodily desire. Historian Dagmar Herzog has shown quite convincingly that this involved a degree of mental gymnastics and a misremembering of the recent past, at least insofar as German student activists were concerned. Casting the Nazis as sexually repressed may have emboldened students to make links between their own sexual practices and the morality of the movement, but it also traded on earlier suggestions that there was something downright nefarious about the sexual politics and practices of the right. History shows that the Breivik case was not the first time that soft masculinity was maligned alongside homosexuality, whose repression could bring national shame and scorn. It also wasn’t the first time that homosexuality was used to attack certain political perspectives and goals. As far back as 1908, imperial Germany found itself in the throes of the Eulenberg Scandal, which ended the carriers of several high-ranking aristocratic members of Kaiser Wilhelm”s inner circle, including the military commander of Berlin Lieutenant General Kuno Graf von Moltke and the Kaiser’s personal adviser in matters of state Phillip Prince zu Eulenburg-Hertefeld. Like the mediatized Breivik case, which provides a timely window into “end of multiculturalism” policies and integration debates in today”s Europe, professor emeritus James Steakley noted some time ago that the iconography of the Eulenberg scandal in Europe”s daily broadsheets was a good barometer of social cleavages in the years leading up to World War I. And now for the cautionary tale. If the Breivik spectacle’s reach and impact is yet to be determined, it can be said with some certainty that the Eulenberg affair had wide-reaching effects on European society. Among other things, it generated national interest into the question of the origins of homosexuality and saw the rise to prominence of sexologist and gay rights campaigner Magnus Hirschfeld. It also led to the the rise of a more militant masculinist wing of the homosexual rights movement, one bent on exonerating hardened masculinity, male bonding, and militarism as the foundation of government. Many future Nazis did in fact spring out of these circles, and while they certainly didn’t make up the entirety of the movement, they did underscore a connection, at least in the minds of adherents, between the emasculating impact of industrial modernity and the pressing need for a rhetoric and practice of militant manliness in the face of these challenges. Breivik’s flawed logic — that multiculturalism threatens to destroy the cohesiveness of European values and thus requires desperate actions by militant martyrs — has a place in the historical register as an example of the links between gender, violence, and rightist ideology. But in our struggle for answers, especially in inferring a connection between soft masculinity and repressed homosexuality with the propensity for extreme violence, we allow fiction to stand as fact, doing violence in our own right to all those whose lives — and lifestyles — serve as a testament to democratic values, progressive politics, and respect for human diversity and pluralism. And we neglect this history at our own peril. So far this month, I’ve gone through hundreds of photographs of neo-Nazi marches, as well as marches against neo-Nazis. Neo-Nazis spread their vitriol through slogans and banners, and people oppose them with signs like these. A question I was asking myself was whether people have more creative ways of challenging the far-right. I found something, but it was not what I expected. People are using humour and pop culture images to counter right-wing extremism. Some of these humorous images I found were caricatures of Hitler with “Nazis sind doof” (Nazis are stupid) written under the drawing. However, with more research and time, I found that people demonstrate a certain wit when ridiculing neo-Nazis. Characters none other than Sonic the Hedgehog and “The Dude” from The Big Lebowski are brought in to challenge hate. (The Dude exclaims that he can stop the Nazis.) Demonstrators go beyond the simple use of pop culture references to challenge neo-Nazis; they also use witty toilet humour to prove their point. Whether it’s hanging banners from apartments or placing clever signs on top of a Port-o-Potty, individuals show their resistance through humour. Countering the far-right can be funny. The question that arises from these photographs is the ethical issue of laughing at neo-Nazis. Can we laugh at a group of people with such deep-seated xenophobic beliefs? Scholars have grappled with this question, with the 1998 film Life is Beautiful used a case study. However, the bigger question these photographs pose is whether humour can be seen as a way to challenge “the hate merchants.” Looking at funny images make us rethink of how people respond to hateful acts in their midst. These humorous images show us that opposing neo-Nazis is not limited to holding signs, but includes using one”s imagination and wit. For these reasons alone, it is key to consider toilets, caricatures, as well as “The Dude” when pursuing academic studies of the far-right. I am curious to see if I find any other pop culture icons fighting neo-Nazism. Perhaps finding SpongeBob SquarePants in an anti-Nazi demonstration is only a matter of time. Today is International Day Against Homophobia and Transphobia. What better reminder of the need for vigilance and action than a hate crime on a university campus in a major Canadian city? The interesting twist? The crime was committed not on the street, in a dorm room, or in a back alley. It was a personal attack in one of the most public of spaces: online. A student was targeted for no other reason than the fact that he is queer and out. Alerted to a series of hurtful and harassing memes on the internet site Quickmeme.com, he did what any concerned and offended person would do — contact the university”s Equity Services and the police to have the matter documented, the offending memes removed, putting the perpetrators on notice. To their credit, the Ottawa Police were swift to take up the call to action. Beyond the irony of a targeted attack being committed so close to the day trumpeted on Twitter and Facebook for raising awareness about the struggles of sexual minorities, this incident provides yet another example of the need to devise new ways to think about cyberspace as a place to combat hate, raise awareness, and reduce harm. The internet is a place where we socialize, shop, trade photos, and gossip. It is also a place where bullying happens, where harassment is unleashed, and where anonymity reigns. Aside from the trouble of tracking down IP addresses and identifying offenders, there is the matter of jurisdiction. How do we enforce existing laws (like university codes of conduct or anti-bullying legislation) while devising new and relevant strategies of education and enforcement to ensure the harassment doesn’t happen again? Because that is what this is, harassment, and it is not just offensive but it is exclusionary and sometimes downright violent, if not in an obvious way, than in ways that make it difficult for students to learn, professors to teach, and the university to function. Why is this kind of thing so damaging? We no longer need to be told that in the internet age, information travels quickly and opinion counts as fact. Ideas posted in Web 2.0 carry the illusion of legitimacy and erudition, even if most of the time it is more idle chatter than information. And we would be wrong to think that images presented to us online are somehow benign or without impact. 21st century Mad Men remain convinced that even the most annoying ads in the sidebar of our Facebook account might surreptitiously motivate us to consume and buy. But this is not the danger posed by memes, those quirky colourful mini posters we send to friends, colleagues, and acquaintances or post on Facebook. They may be transitory expressions of emotion and critique. But they are also social texts in the classical sense. They are documents of popular sentiment, and if they were found 20 years from now by historians, they would be taken as evidence of how our society viewed both the mundane and pressing issues of the day — with humour, irony, wit, and, in this case, outright malice. Universities are places of learning and thinking. And they are also places of work. In response to anti-bullying legislation like Bill-168 and student-driven initiatives to have the needs of diversity met, universities across Canada are developing safe space training to better educate students, professors, and staff about ways we might all ensure that university space — online as well as in the classroom — remains free from the stain of prejudice and hate. Another way that this is happening is by re-occupying (to borrow a phrase from another movement) the space of anonymity and aggression in order to re-cast it as a place of tolerance and opposition. Whether through “It Gets Better” videos or by simply tweeting our outrage at acts such as these, we leave our own mark online in opposition to the actions of the bullies. While it might not stop the next malcontent from clicking a mouse and uploading invective, or do away with the pain of being targeted, it still might be an important step towards making cyberspace a safe space. And that certainly is a step worth taking. For the next three months, I will be a graduate researcher for Hate 2.0. My research background fits in nicely with this project; I recently completed my Master”s Research Essay which discussed how the public uses YouTube for Holocaust remembrance in the 21st century. Social media, I believe, is increasingly becoming more pertinent to study because of all the information it exposes, whether it be through Flickr, Twitter, Facebook, or other platforms. To see how neo-Nazi and far-right activity is exhibited on Web 2.0 will ask new questions on how hate is discussed in the public sphere. My research for this project, however, will not be to look at neo-Nazis themselves, but how everyday people oppose their activities, marches, and demonstrations. This will be done by seeing how they use social media outlets like Flickr and Twitter, as well as examining how their acts are reported on the Web. My research thus far has looked at reports by the Bundesverfassungsschutz or BfV (Federal Office for the Protection of the Constitution), a news series by Die Zeit about right-wing extremism in Germany, as well as citizen-run social media campaigns like no-nazi.net. I have also benefited from David’s research, which can be seen in blog posts below. His work on Flickr users Boesealtermann (or angry old man) and PM Cheung will no doubt be useful for further research on how people use Flickr to take a stand against neo-Nazi and far-right activity. In the coming weeks I will blog regularly about my findings as well as photographs and websites I find intriguing. I hope you follow along as I discuss my research on Hate 2.0 in more detail. And please don”t be shy to comment on my posts! Much of the debate around hate on the internet inevitably focuses on those propagating hate; the neo Nazis, the white supremacists, xenophobes, etc. If you listen to some of the more hyperbolic news stories out there, then the Internet is a cesspit of hate and violence, seething with extremists preaching their message from every metaphorical soapbox out there. Response to this gloomy image, naturally enough, tends to focus on government as the answer; more legislation, more censorship, tighter controls over the internet. Sarkozy’s recent response to the Toulouse Shootings is one notable incidence of this kickback, while much of the coverage regarding the trial of Anders Breivik has carried a strong undertone of repugnance at even permitting Breivik an opportunity to voice his views. The general desire floating around appears to be – simply shut these people up. But if social media and web 2.0 applications allow those at the extremes of the political spectrum to voice their opinions, surely they also allow those opposing them to make their voices heard. Flickr is an interesting website; while nominally a photosharing site, it also contains strong elements of a social networking forum. The photostream feature has a Twitteresque feel to it, while a Flickr contact is essentially a Facebook friend in disguise, and the variety of groups, pools, and commenting venues makes the site as much a social venue as strictly a photosharing site. Simple word searches or group searches will instantly yield a solid result of anti – Nazi or anti – fascist material, and after cruising through enough of it, the same usernames keep on popping up. These individuals provide extensive amounts of content, with pictures ranging in the tens of thousands, while also administering, moderating, or contributing to many groups dedicated to combating the extremist movements, Anti-Nazi und Antifa – Fotos being one example. A simple network analysis of some of these users reveals a dense community of well connected individuals, most of whom also maintain a presence on Twitter, Facebook, or the blogosphere. Many of these individuals are self proclaimed photojournalists who document aspects of the nazi/anti-nazi debate, most noticeably demonstrations. 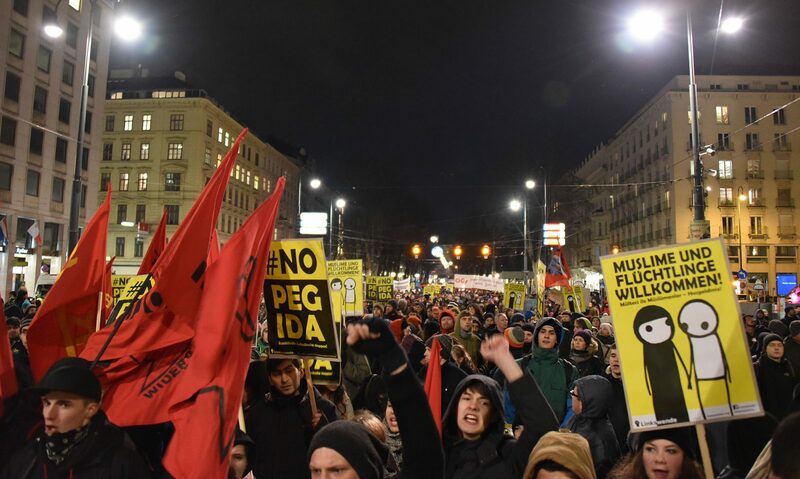 The Dresden marches and countermarches feature prominently, as do many other protests dedicated to promoting or combating the neo-nazi movement. All of this material weaves together in a coherent anti extremist movement through comments, dialogue, discussion, and raising awareness, the same as any other social initiative. But curiously, the individuals posting this material demonstrate a strong suspicion, if not downright hostility towards government and police. For every photo of a protestor holding a sign expressing an anti-extremist sentiment, there are two displaying a menacing line of riot police, batons and shields held at the ready. User profiles are typically bare, multiple aliases are common, and most archives are tagged with a statement which includes something along the lines of, “I am not a Nazi.” Considering some of the more draconian proposals regarding control of internet content floating around, I would have to say that their paranoia is somewhat justifiable. Ironically enough, these users are dedicated to combating extremism, but for even discussing the issue, they clearly feel threatened by government. Ordinary citizens appear to be taking up the mantle of combating hate; Flickr is just one tiny aspect of an ever burgeoning social media landscape. Discussion, debate, ideas, and solutions are being bandied about across the relatively free internet; so clearly civil society is attempting to counter extremism on its own initiative. Perhaps the media spotlight needs to be readjusted, because for every individual propagating hate, there are well organized ordinary people out there who are fighting back. And ordinary people taking action are far more effective than any government could be. Well, the I-Cureus program is winding down, and now that the semester has wrapped up I have found a bit of time for some contemplation. Eight weeks ago if you had asked me about online hate, social media, or social network analysis, I probably would have shrugged my shoulders and cheerily suggested that you ask someone else, because I didn’t have a clue. Eight weeks later, via a sometimes bumpy and turbulent path, I have somehow managed to acquire a rough understanding of the basic concepts. My desktop is now cluttered with a variety of data mining and graphing software, I have logged enough hours on Flickr that I tripped my internet download limit for this month, and if certain individuals knew how long I spent going through their Twitter feeds, they would be very, very afraid. Of course I have not even scratched the surface yet, but I feel that instead of a vast unknown, I face a slightly mushy yet definable group of concepts. Which I think was the whole point of the program. While hopefully my research will contribute in some small way to the overall Hate 2.0 project, learning how to approach a totally foreign problem was an invaluable project in and of its self. Learning how to sift through the enormous quantities of literature and pull out the meaningful information, followed by learning to use the social network analysis software and theory, and then actually applying it all required an…expansion of my typical research skills. It involved moving beyond the library and textbooks, utilizing the considerable human resources available to me, tracking down academic work and projects which have been published in a very non-traditional (at least for history) medium. Then when you toss in the process of being responsible to a supervisor with deadlines and project goals, as well as being part of, and therefore bound by, a larger project, well let’s just say an undergraduate research paper doesn’t seem so bad any more. I am indebted to Professor Evans for guiding me through this project and Professor Shawn Graham for putting a friendly face on otherwise terrifying technology, as well as the rest of the Hate 2.0 team and the History Department here at Carleton. As I sit and write this post, my Twitter feed is updating every couple of minutes with news of the aftermath of the Toulouse gunman’s death. Trending worldwide since Mohammed Mehra’s horrifying actions a few days ago, resulting in the deaths of Jewish schoolchildren, a rabbi, and three members of the French armed forces, this tragic chain of events has quickly become a social media fixation. Alongside the journalists seeking to craft the media message, average citizens tweet their anger and frustration with these acts of targeted violence, some of them searching for answers in the blogosphere and among the youtube and flickr sites generated by those spewing hate on the far right. Speculation is rampant and the answers few. In the eye of the storm, the French government struggles to project an air of confidence that perpetrator networks will be uncovered and all those responsible — both near and far — will be brought to justice. Included in President Sarkozy’s statements in the immediate aftermath of the gunman’s death is a familiar refrain, one we heard in the days after the Oslo shooting as well: that all those caught frequenting social media sites casting hateful messaging will be a focus of investigation, if not themselves prosecuted (“Sarkozy to Act on Hate Websites” Irish Times, March 22, 2012). How quickly online media, social networking sites, and virtual relationality becomes stigmatized. Just how shortsighted (to say nothing of unrealistic) is this stance? By now, we know that we need to protect our online selves from nefarious efforts (almost every other week) to attack our privacy. Still, the underlying belief in the net’s democratizing impulse seems to reign supreme, regardless of what Evgeny Morozov might say (See “Texting Ourselves to Utopia” in Boston Review). Recent events in Toulouse beg the question: while the web is a breeding ground for extremism (requiring government action), is banning far right sites and monitoring all those accessing them truly the answer? Is there not something to be said for the way even the most sordid of the web’s “episodic publics” (to use German sociologist Jürgen Habermas’s phrasing) creates conditions for opposition, discussion, consciousness building, and global citizenship? In an article from 2006 (http://archivos.brunner.cl/jjbrunner/archives/1-Habermas_Deliberation2006.pdf), Habermas argues that deliberative democracy is possible in conditions where there is a “self-regulating media system and a responsive civil society.” In this vision — although he isn’t explicitly thinking of the heavily mediated social web — this is a public sphere where “input from citizens gives voice to society’s problems,” intervening in the form and shape of elite (and one might add fringe) discourse. Participation in that system is the key. Citizen intervention — even in the darkest places of the net — as consumers, observers, respondents, readers, maybe just as lurkers, is part of the circulation of ideas, the place where people develop mechanisms to refine and rethink the terms of debate. We certainly need to nuance the idea that all talk is good talk (and not just chatter). And in moments like this, perhaps we might be forgiven for reacting with emotion. But we also must remind ourselves that the web is made up of a multitude of people, many of whom are equally outraged and in search of answers. Hate sites are plentiful, a blight on our social communication networks. But accessing them, reading their content, and responding to them emotionally, in print, or otherwise, cannot be seen as inherently destabilizing to democratic or humanistic values. The answer to the problem of radical thought does not lie in quick fix solutions and sound bites. Although these too — circulating online now, on Twitter, and in the various news feeds — have now become part of the global conversation, motivating some to seek revenge and many more to commit themselves to shaping the debate and opposing hateful attitudes wherever they may surface, online, in newspaper comment pages, in the checkout, school yard, and home. At the very beginning of the Winter 2012 semester, I learned that my application for an I-CUREUS undergraduate researcher was funded (http://www5.carleton.ca/students/enhance-your-degree/undergraduate-research/i-cureus/). The programme is designed to give undergraduates research experience during their BA to provide them with a new skill set and an introduction into academic problem solving. David — a third year History Honours student — was warmly recommended to me by a colleague. He seemed eager, curious, a bit wary, but ultimately excited about jumping into a project with both feet, especially one on something so un-history-like like social media and online hate. Our first meeting went swimmingly, and after a few administrative hiccups, he was well on his way to his first task: a review of the literature. Collect was is out there, assemble it according to theme and argument, and provide some synthesis and a working way forward. Only in this case, the terrain was vast and the surroundings unfamiliar. Unconventional is one word for it. I’m certain he thought of a few other descriptors as he wiled away the hours huddled in front of his computer, tapping his way through search engines, article databases, and boolean keyword strings. The end result was a cogent review of all he was able to find — with only a minimal direction and “guidance” (in scare quotes). This sense of alienation, frustration, and possibly even despair was exactly what all researchers face when exploring a subject for the first time. And it was what I wanted him to feel too. My sink-or-swim method was precisely that — a way to make him unsettled, to de-familiarize a subject which at first hearing might appear self evident, especially to a generation weaned on Facebook, Twitter, and smart phones. Did he find all the relevant information? Of course not. But that wasn’t the purpose either. Rather, I wanted him to figure out for himself the nature of the conversations out there in the academisphere (my word, at least I think it is). What did he find? That while there is much emphasis on skinheads, hate literature, and far right groups, very little exists on how average people register and mobilize creative opposition online. Thinking he had failed in his task, he was oh-so-happy to find out that, in fact, no, this was precisely what I had wanted: for him to find the gaps in the literature and recognize the sheer enormity of the issue. How best to proceed? By defining our terms between far right and neo-Nazi, by recognizing there are important and vast differences between media platforms and the discourses they generate, and understanding that all research comes from a bit of organized chaos, a haphazard process of fits and starts. I-CUREUS for what develops. R U?